This wasabi cucumber avocado dressing is super creamy and full of flavor! Pair it with a spiralized cucumber and carrot salad for a delicious vegan dish that'll shake up your salad game! Recipe yields 2 large meal-sized salads or 4 side salads. Combine dressing ingrediens in a small food processor, blender, or use an immersion blender to whip into a dreamy creamy dressing. Chop each end from your cucumber and transform into salad-ready noodles using a spiralizer, veggie peeler, or mandolin. Going gadget-free? simply chop into thin slices with a sharp knife. Easy peasy! 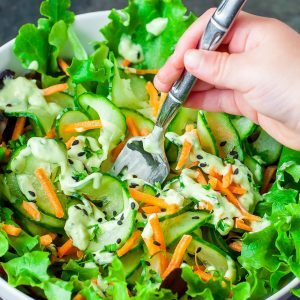 Serve cucumbers over a bed of lettuce and top with shredded carrot, sesame seeds, and wasabi cucumber avocado dressing. * No rice vinegar? No problem! Feel free to use apple cider vinegar, champagne vinegar, or white wine vinegar. Recipe yields 2 large salads or 4 small sides. The dressing is super duper customizable! Add as much wasabi as your little heart desires (or as much as your tastebuds can handle) or keep it on the mild side. You can also sub fresh garlic for the garlic powder for a serious bite of garlic. Love vinaigrettes? Feel free add an extra splash or two of vinegar to the dressing. Taste as you go and let your taste buds be your guide! This recipe yields 1 cup of dressing, which can serve 4-6 depending on how dressing crazy you get with your salads. The salad itself yields 2 lunch-sized portions but feel free to double or triple as needed. You can also easily halve the dressing recipe and use the extra half of the avocado as a salad topper!I whisked in an extra splash of rice vinegar at the end before serving because I'm crazy for vinegar-y dressings on my salads!